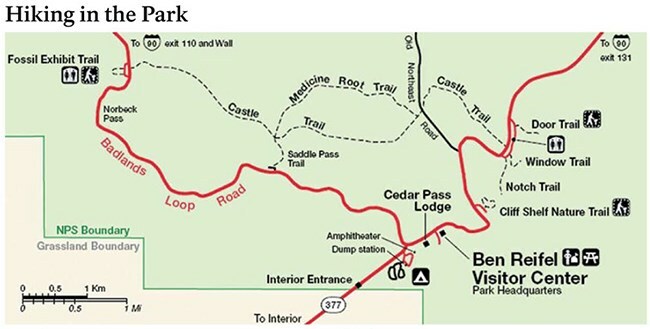 There are three short trails that share the same trailhead on the far eastern section of Badlands National Park. The Window and Door Trails are boardwalks that explore the spires and buttes of the Badlands Wall. Notch Trail passes through the Wall and offers a great view of the White River Valley. There is even a fun rope ladder that takes you to the canyon rim as you head to the “Notch.” Some of the best views of The Badlands can be found on these short trails. My brother Dave and I hiked Notch Trail on Wednesday, May 23, 2018, and Door and Window on Monday, May 28th. Each were something we did at the end of longer hikes to fill out the day. Hike Rating: Window and Door Trails are very easy, mostly on boardwalk. Notch Trail is a bit more strenuous, but only moderately so, and still only 1.5 miles round trip. Trail Condition: Window Trail and first half of Door Trail on are boardwalks. Notch Trail is on Badlands clay. Not recommended after a hard rain. Those with a fear of heights should beware the rope ladder and rim edge on the Notch Trail. Starting Point: Large parking area shares the trailheads for all three trails. Trail Traffic: This is a busy section of the national park, so expect crowds. How to Get There: From Wall, SD take Hwy 240 to the entrance to Badlands National Park, then travel the Badlands Loop Road to the large parking area on the left. All three trailheads are there. These three trails are on the right hand side of this map. Notch Trail begins by wandering through a canyon, surrounded by buttes and pinnacles on each side. About half way through you reach a rope and log ladder on your right that climbs to the rim about 40 feet above the canyon. The first half of the ladder can be walked, but as it steepens, getting on all fours is required to maintain balance. It really isn’t particularly dangerous. Once on the rim, there is some exposure to the edge. Pay attention, and watch your step, as you don’t want to tumble into the canyon. Those with height fear may have a little trouble here. After three quarters of a mile you reach the “Notch,” a dead end of the trail. From this vantage point you can see far away into the White River Valley and toward the small town of Interior, located just outside the southern boundary of the park. Later, as you continue south on the Badlands Loop Road, pause at the next pullout and look back over your left shoulder to see the “Notch” perched up on the cliff. This is an out and back hike, so return is via the same pathway. It’s a little more difficult getting down the ladder, just because you’re backwards. A wheelchair accessible ¼ mile boardwalk leads through a break in the Badlands Wall known as the “Door” and to a view of the Badlands. If you aren’t bound by a wheelchair, though, you should definitely continue out onto the clay surface beyond the boardwalk. Follow the numbered stakes for an additional quarter mile into the heart of the maze of arroyos for the best views. While not the most colorful spires in the park, I think this section of the Badlands Wall is the most intricate and detailed. Definitely one of the best views to be found. This very short trail leads to a natural window in the Badlands Wall with a view of an extremely eroded canyon. This one is also on a boardwalk for wheelchair access. WARNING The Badlands has a very arid climate with no trees for shade. Summer in particular can get quite hot in the afternoons, so carrying plenty of water and slathering on the sunscreen are important precautions. A hat and sunglasses are also recommended. Watch for quick moving storm clouds and take rain gear if the sky looks threatening. Sturdy boots will help protect your ankles from cactus spines, and from the mucky mud that forms after a thunderstorm. Otherwise, have fun!